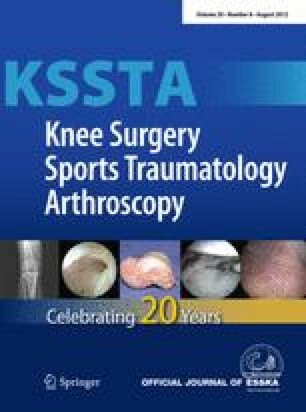 The aim of this study was to examine clinical and patient-reported outcomes as well as return to sport in athletes younger than 25 following ACL reconstruction with either bone-patellar tendon-bone (BTB) or hamstring (HS) autografts using a matched-pairs case–control experimental design. Twenty-three matched pairs were obtained based on gender (57% women), age (18 ± 3 years BTB vs. 18 ± 3 HS), and length of follow-up (5 ± 2 years BTB vs. 4 ± 2 HS). Patients reported participating in very strenuous (soccer, basketball, etc.) or strenuous (skiing, tennis, etc.) sporting activity 4–7 times/week prior to their knee injury. Patient-reported outcomes included return to play data, the IKDC, SAS, ADLS, and SF-36 forms. Clinical outcomes included knee range of motion, laxity, and hop/jump testing. The majority of patients in both groups were able to participate in very strenuous or strenuous sporting activity 4–7 times per week following surgery [17 (74%) BTB vs. 16 (70%) HS]. However, only 13 (57%) of the BTB subjects and 10 (44%) of the HS patients were able to return to pre-injury activity levels (P = n.s.). HS patients showed higher ADLS (P < 0.01) and SAS (P < 0.01) scores, better restoration of extension (P < 0.05), and less radiographic evidence of osteoarthritis (P < 0.05). Hamstring and bone-patellar tendon-bone autografts allow approximately 70% of young athletes to return to some degree of strenuous or very strenuous sporting activity, while only approximately half of patients were able to return to their pre-injury sporting activity level. Hamstring grafts lead to better preservation of extension, higher patient-reported outcome scores, and less radiographic evidence of osteoarthritis. Therapeutic (case–control study) Level III.